Okay, seriously, how is it possible that my baby is 6 months old??!? I honestly still think she's a newborn most of the time...it's going WAY too fast. We had a pretty good month. We finally got her naps figured out, and she's been doing great with 3 naps each day, but I'm kinda thinking she's getting close to dropping her late afternoon catnap. Hopefully once that happens, she'll lengthen her afternoon nap a bit more. Night time sleep is up and down. Some nights it's great - she sleeps straight through with just a quick wake up around 5-6am. This week was off for some reason...I'm thinking we'll be seeing the first tooth pop its little head up any day now...at least I hope so, otherwise I have no explanation for why my normally good sleeper has been having such bad nights. C'est la vie, I guess. Nursing is still going well, but she's starting to get distracted more easily while eating, especially if Tessa's around and making noise. I'm not sure what she weighs right now, we have her six month doctor's appointment next week, so we'll find out then, but I'm thinking she's getting close to 20 lbs. The six month mark really snuck up on me, and I guess it's time to start thinking about solids too. She hasn't really shown any interest as far as grabbing for food or watching us eat, so I'm not in any hurry. I've been reading up on baby led weaning, and would like to give it a try with Violet. She's starting to get a lot more mobile. When she's on her tummy she turns herself in circles, and she's started rolling from tummy to back, but not the other way yet. We pulled out the exersaucer a few weeks ago and she loves being in there - I think she enjoys the new perspective she gets from being up higher and off the floor. She really seems to want to sit up and even stand. When you hold her up, she locks her legs and is quite strong. Maybe we'll have an early walker this time. Her little personality is so sweet. She's quick to smile at anyone and everyone, and she loves attention. Sometimes if you look away she'll squeal until you look back at her, then she lights up. She's a little chatterbox once you get her going, and her giggles are the best. She's pretty easygoing most of the day, until late afternoon - usually right when I'm trying to make supper, when she seems to need more attention or activity to keep her from getting a little cranky. But as always, as soon as she sees the bathtub come out, she settles right down and is content again. Everybody comments on Violet's big blue eyes, her long eyelashes, her red hair, and, of course, her huge smiles. She's a beautiful girl in every way and she brings so much sunshine into our home. Well, so much for monthly posts...haha. Hopefully I'll have my act together enough to manage a monthly update starting at 6 months, but whatever, we'll all survive if that doesn't happen. It has never been more clear to me than it is now that I just cannot do it all, if I want to keep my sanity, that is, so I've kind of stopped trying in some areas, blogging included. The last month and a bit have been rocky for everyone. Violet got her first cold, hit a growth spurt and a wonder week all at the same time, and I'm pretty sure she also hit the dreaded 4-month sleep regression. Not fun. I'm hoping we're through the worst of it and we can have some smoother sailing for a bit. Routine: She's been on a 3 hour feed/wake/sleep routine since the beginning. She definitely hit a growth spurt right around 3.5 months, and was nursing every 2.5 hours for a few days. We're working now on moving her more towards a 3.5-4 hour cycle, which she's adjusting well to. Sleeping: Just before she hit 4 months, she was sleeping 11-12 hour nights, from 7:30/8pm to 7/7:30am with a dreamfeed between 10-10:30. Then just after she reached 4 months of age, she started waking during the night again. Sometimes not until 5am, but other nights it would be 2am or 4am. I was pretty sure she was waking out of hunger, since her wake up times were all over the place, so our approach was to first try getting her back to sleep if we could, and if it wasn't happening, or if she'd go back to sleep for just an hour or so, I'd just chalk it up to the growth spurt, feed her, and put her back to bed. Now that we're closer to 5 months, we're back to 8-10 hour stretches, which I'm happy with. Naps, however, have been a much bigger source of stress for me and have taken so much effort and work, for what feels like very little payoff. We've been struggling with short naps for the last 6 weeks or so. She sleeps about 30-45 minutes, then wakes up and it often takes a good 20-30 minutes or more to get her back to sleep, only to have her wake up again after another 20-30 minutes of sleep. We've worked on adjusting her wake time to make sure she's not too over or under tired, making sure she's not too overstimulated during wake time, and on and on. I've been driving myself crazy trying to fix it, but I think we may just have to accept that we have a short napper on our hands, take the longer naps whenever we can get them, and enjoy the extra awake time we get with her. She's almost always a happy girl when she's awake, so I have to believe that she is getting enough sleep. I'm constantly having to remind myself that maybe I need to adjust my own expectations and remember that babies don't always fit into the nice little boxes that we try to create for them. I'm doing the best I can to encourage good sleep (and I can only do so much with a toddler in the house who also needs my attention), but I can't force it, so it is what it is. Eating: Still eating well and growing like a weed. 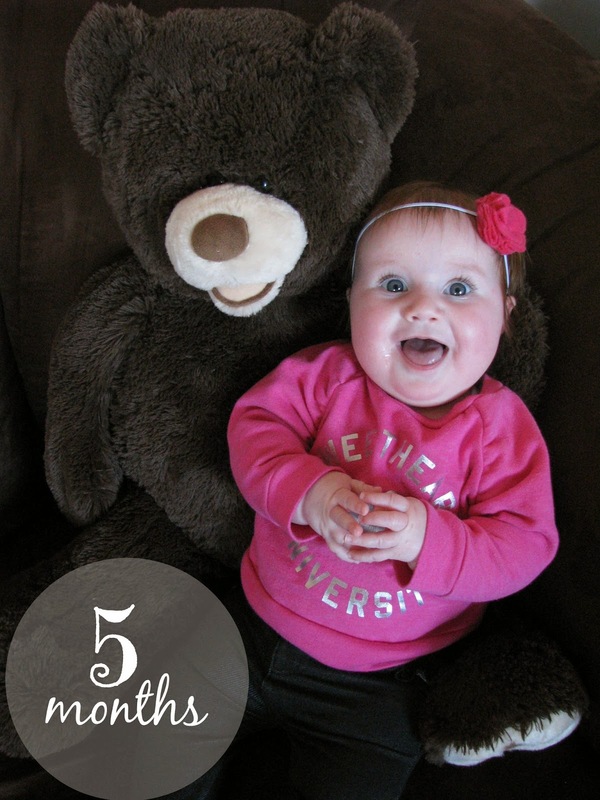 She was nearly 15 lbs and over 24 inches at her 4-month appointment, about 75th percentile for both height and weight. She seemed to take so long to get out of her newborn clothes, but flew through the 0-3 month clothes and is now in her 3-6 month things. We also finally got her into her cloth diapers around 3 months - her legs were just too skinny before that to get a good, leak-free fit. She fills them out nicely now. Doing: Lots of cooing and babbling, and we've been able to get a few little giggles out of her. Tessa was never a giggly baby and we were hoping Violet would be different, but so far, she's almost as difficult to get a giggle out of as her big sister was. She definitely makes up for it in huge smiles though. She's much more interested in toys now, and she's trying so hard to roll over but hasn't quite managed it yet. She tries to self soothe by sucking on her hands, but that often backfires on her when she makes herself gag on her own fingers. She recently figured out how to blow spit bubbles, so she entertains herself by blubbering away and laughing at herself. Her favorite time of day is still bath time and she splashes around and makes a big mess. Me: I've been really struggling this last little while. I mentioned in my last post that we decided to use Babywise this time, with the hopes of getting better sleep earlier than we did with Tessa. On the one hand, I'm glad we chose this method, because we have seen some very positive results - Violet sleeps about a million times better at night than her big sister did, so I'm grateful for that. I think Babywise offers some really great guidelines on routine, structure, and teaching healthy sleep habits to babies. On the other hand, we are not seeing the 'perfect' 12 hour nights that Babywise promises and we are having big struggles at naptimes. This would probably be ok ordinarily, except that now I've got it in my head that because things aren't going exactly as the book promises they will, that somehow I'm failing. Of course I know that each child is different and that this method doesn't even work for some babies and families and for some it just takes longer and so on. I guess maybe the problem is ME - that maybe I've set an impossibly high expectation for myself and my child and don't realize when I'm pushing too hard until I get almost to a breaking point. Yes, sleep is valuable, but it's NOT more valuable than my sanity, my relationships with my children and husband, and my ability to enjoy motherhood - which, I'm sad to say, I haven't been doing lately. So, I guess what I'm saying is that we're going to take the good we gained from Babywise - a good routine, decent sleep, and most importantly, a healthy, thriving baby, and leave the rest behind. And one last photo of our two precious blessings...I can't even handle all this cuteness!!! Now that we've made it through the fourth trimester with Violet, I'm finally feeling like things are settling down a bit and our routine is somewhat predictable (on good days). I'm hoping this will give me a chance to take up a bit of blogging again, but I'm guessing I'll be lucky if just get a post a month done. Life is flying by so quickly and I feel like I have so many things I could write about, but there just simply isn't time in the day to sit down and write. So, I'm hoping I can at least get some monthly updates in and maybe one or two additional posts throughout the month, depending on how things are going. I never did monthly updates for Tessa, but now I wish I had, so I want to make sure I do them for Violet. I find that I'm constantly trying to remember at what age Tessa did certain things, and where Violet's at in comparison, but other than the things I wrote down in her baby calendar or in blog posts, I just can't remember! So sad. You think you're going to remember all those little things, but unless you write it down, you probably won't. Lesson learned! Anyway, our first three months with Violet started out easy-peasy, then got hard, and are now somewhat leveling out again. She spent the majority of her first 6-8 weeks literally just sleeping and eating, and was really content and easygoing...she'd sleep anywhere, anytime, only cried when she needed to eat, and was pretty much locked into a 3 hour feeding routine from the day we brought her home from the hospital. But then she started waking up and being more alert, and it's been hard trying to find the balance between her needs and Tessa's and finding a new groove with two, along with getting done all that needs to get done around the house. We're slowly getting there, but it hasn't been easy, and I think it's safe to say that having two kids under two is probably one of the harder things I've ever done. But it's not supposed to be easy all the time, now is it? I'm not complaining, nor do I regret having them so close together, I'm just saying that it's been hard at times. I suspect that adding another child to the family at any time is hard, no matter what the age gap is, since it's a major life change and a huge adjustment for everyone, and that's hard no matter what. Routine: Like I said, Violet's been great with settling into a routine. She eats every 3 hours, pretty much like clockwork, which makes getting out and doing errands pretty easy. I always know I have exactly 2.5 hours to get out and back home before her next feed, and so far she's had no trouble napping on the go. I suspect that will change as she gets older, but for now, I'm taking full advantage of it when I need to. I try really hard to have both girls sleeping at the same time in the afternoons, and on good days, that happens for about 1-1 1/2 hours right after lunch. I call this my "magic hour". I really need this time to either get something done or to just sit down in the quiet and rest, so on days when it doesn't happen, I really notice and feel like I'm playing catch up the rest of the day. Tessa still naps about 2-3 hours each afternoon (12:30-2:30/3pm), so with the way Violet's naps are right now (12pm & 3pm), it also allows me to have a bit of one on one time with each girl every day, which is important to me too. Sleeping: We've been doing things a bit differently in this area than we did with Tessa. We've been trying to follow the Babywise principles, so we worked hard to establish her on a feed-wake-sleep routine, have been trying to encourage her to fall asleep on her own, and are working towards lengthening naps and nighttime sleep. She's responded really well for the most part, and by the time she reached 3 months, she was consistently sleeping from 8-10 hours at night. Naps haven't been going quite as smoothly, but we're seeing progress and are hopeful that we'll soon get to where we want to be. Eating: Violet took to breastfeeding like a pro, which I am so, so thankful for. Tessa and I had a difficult start to breastfeeding, so I was afraid that it would be the same for Violet, and especially with her being a preemie and having started out on bottles. She didn't even get to breastfeed for the first time until she was 3 days old, and started out with only a few minutes at a time, so I definitely worried how the transition to exclusive breastfeeding would be, and if it would happen at all. It was really hard having to pump every 3 hours around the clock for the first several weeks of her life, but thankfully that's in the past, and I'm so happy to say that Violet has had no trouble at all with breastfeeding. We are so fortunate to have a wonderful clinic in our city with two doctors who specialize in breastfeeding, and I was able to get in to see them right away once we brought Violet home. We discovered that Violet has an upper lip tie, but fortunately it hasn't interfered at all with nursing, so we chose to leave it alone. We only needed 3 or 4 appointments there before they discharged us with Violet nursing like a pro and gaining weight beautifully. She continues to nurse well, every three hours during the day, and is growing like a weed. She was in the 6th percentile for weight at birth, and at her 3 month appointment was over the 60th and has gone from a scrawny, skinny little peanut, to a chunky monkey with lots of squishy rolls. Doing: Like most newborns, she didn't do much of anything her first couple months, so there's really not a whole lot to say. She still sleeps a good part of the day (when she naps well), but when she's awake she likes being around people. She likes watching Tessa play and loves when her dad and I make faces and noises. She has the biggest, sweetest smiles and is such a happy baby. She absolutely loves her baths, and can go from crying and fussing to completely content and all smiles when we put her in the tub. She's not really attached to any toys yet, in fact, she kinda doesn't even care about them at this point, but she'll bat at things on her play mat and can hold on to something when you put it in her hand. She prefers her fingers to anything else, and they are almost constantly in her mouth. I love the way her face lights up when she sees me or her daddy and she always seems to have a little twinkle in her eye. I have a feeling she will be a little mischief maker when she gets older...maybe even more than big sister is!